When I originally wrote this post, I’d just jumped off the weeks webinar with Lisa Corduff. The topic of weight got me all inspired because we are so fixated on it, yet it’s the constant bane of so many of our lives. I’m guilty. I’ve watched my weight go up and down over the years quicker than I can burn off last nights dinner. I get it. We (collectively) are fascinated by it – some of us not necessarily willing to admit. Yet the older I get (and the more I understand my body) the less obsessed I’m becoming – because straight up, weight doesn’t define health. We chatted about causes of weight gain and there were a few stand outs I think would really help people understand their bodies better. So often we look at gaining weight as the problem when it is actually a symptom of the real issue. The clue – understanding that where you are gaining weight helps point you in the direction of what the issue is! As a guide, you may like to refer to the image we’ve created to help you. 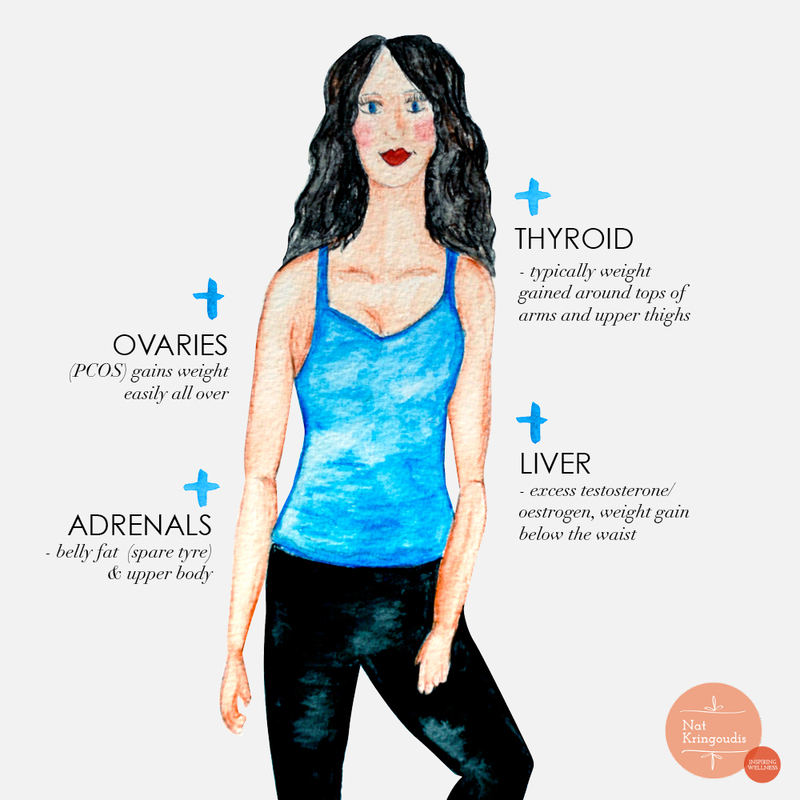 It’s important to remember that hormone health issues will cross over, meaning you may have one or more of these problems going on at the one time – like your adrenals affecting your thyroid and so on. But freedom comes with the clues that this serves us! In fact far from it! We all need to nourish our bodies in the right way, but we are all a little different from the next person and that’s ok. Imagine if there were 1,000,000’s of me! I can’t even. But if your hormones are running the show, you can munch on all the kale on the planet and continue to gain weight. Of course this also depends on our genetics, environment, liver’s ability to detoxify, stress levels and the list goes on. The ah-ha moment you can take away from this – it’s not just about what you put in your mouth. Stress – we’ve just got to break up! Because I know you want to dig deeper, I created Debunking Your Thyroid – the masterclass that will help you take back the reigns of your thyroid and show it who’s boss! Because you may literally be just 2 hours away from a happier and healthier thyroid and a lighter, brighter you. Click here for more info and let me help you live your best life. When you join you also get class notes, a copy of my book as well as access to the exclusive group of women who have debunked their lives for the better. Hey Nat, could you have a concern with all of these, ovaries, thyroid, liver and adrenals and therefore put on weight in all of these places???? Thanks.